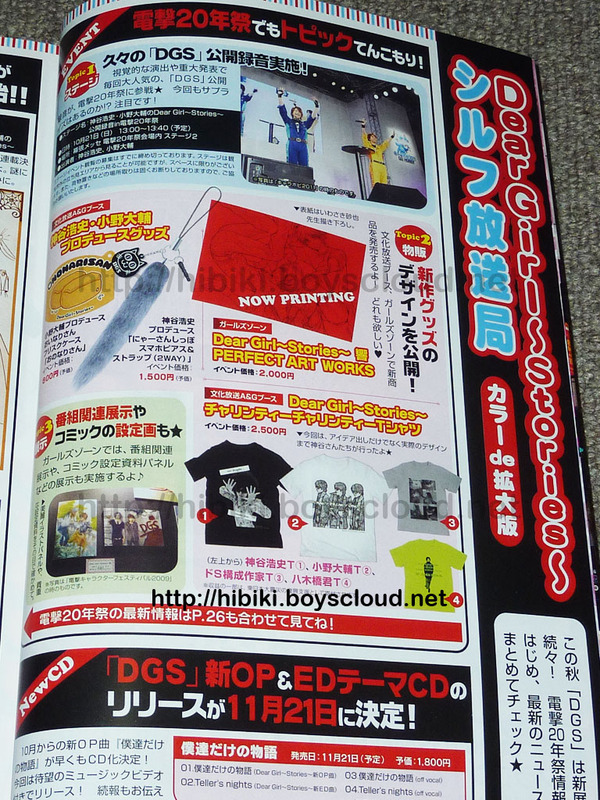 This month’s SYLPH magazine features DGS Hizuki on the cover and includes information about the goods that will be available at the Budoukan event. The DGSFCM official website also lists a clear file set for 700 yen as part of the event goods, but that was not included in the information in SYLPH. The photos on the clear files will be photos of Kamiya and OnoD that were not included in the event pamphlet. Only one more month until the big event! The latest issue of SYLPH revealed the human ver. and vampire ver. character designs of HiroC and OnoD for Dear Girl ~Stories~ Hizuki. The new comic will be illustrated by Hidou Ren and debut in the January 2013 issue of SYLPH to be released November 22, 2012. 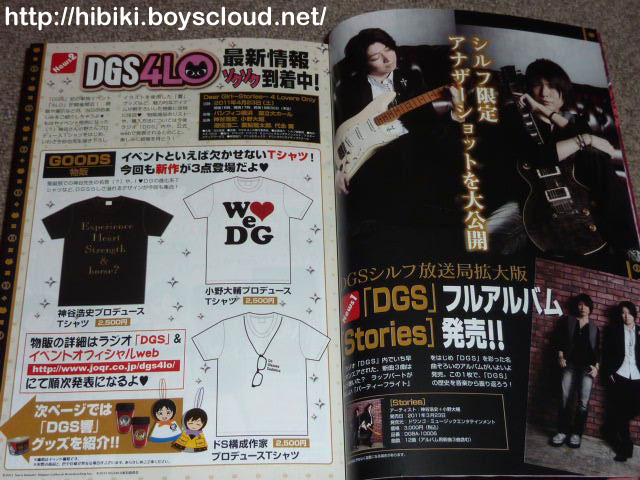 DGS Hizuki will be on the cover of that issue. 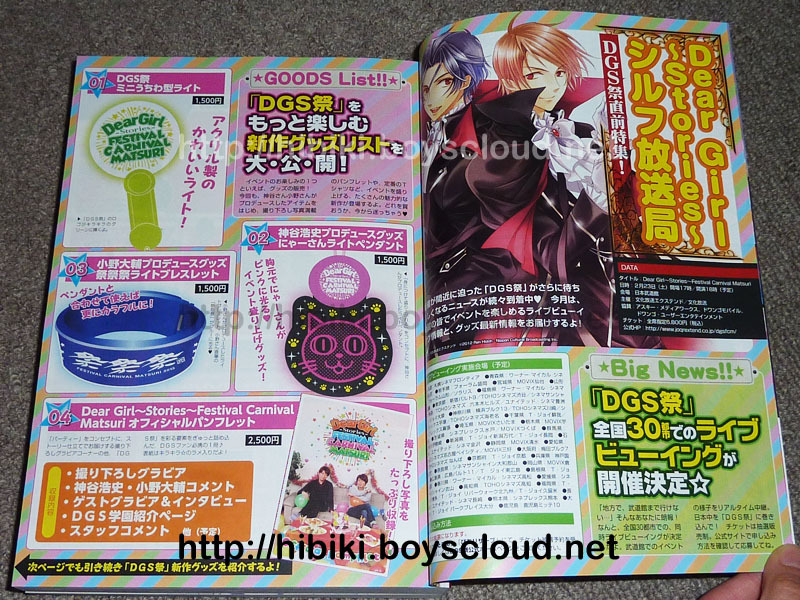 The goods line-up for Dengeki 20th (read: Dengeki nijuunen sai) was also published. The DGS Hibiki art book will be available for purchase at the Girls’ Zone while the other goods will be available at the Bunka Housou A&G booth. 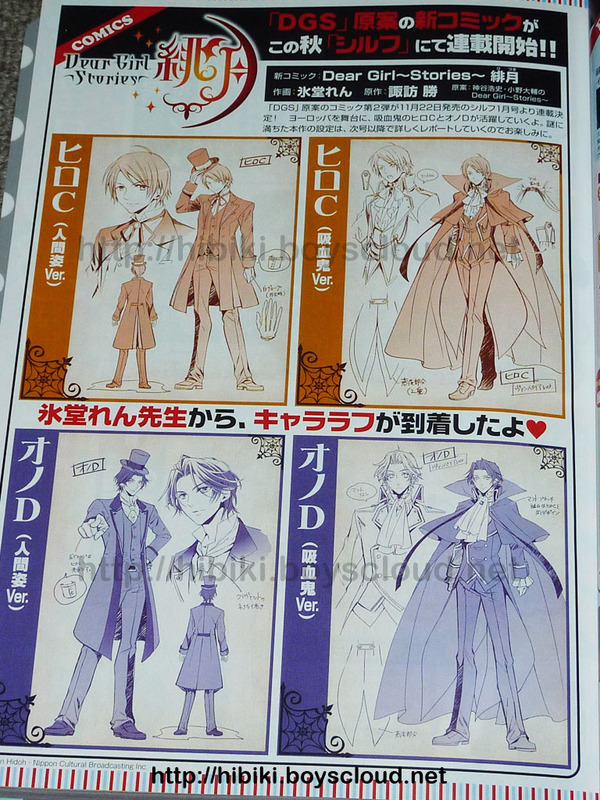 Rough illustrations for DGS Hizuki will also be on display at the event. Dengeki 20th will be taking place October 20-21 at Makuhari Messe halls 1-4. Admission is free. The DGS public recording will be taking place on October 21 at 1PM on Stage 2. 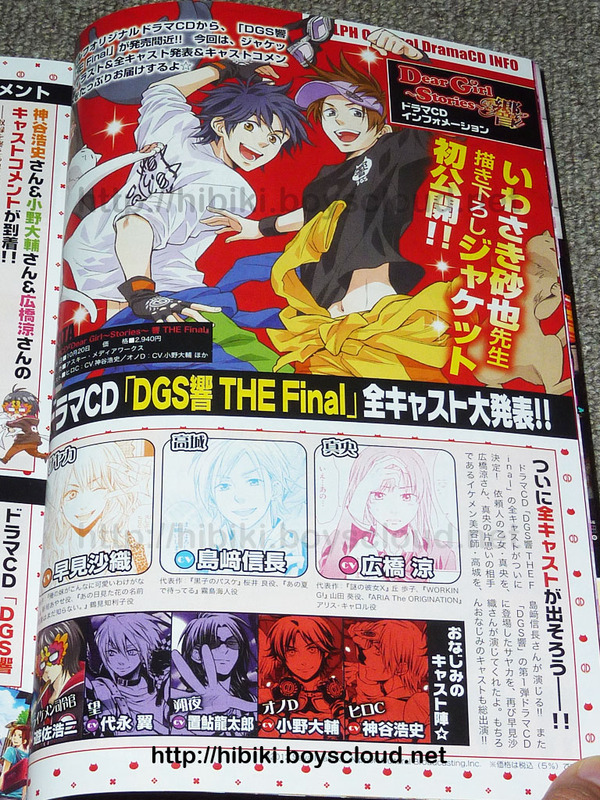 Also announced in this month’s SYLPH was the cast for the DGS Hibiki THE Final drama CD, and the jacket cover illustrated by Iwasaki sensei was revealed. Of course, the rest of the cast will be the same. The drama CD will be released on October 20 and retail for 2940 yen. A trial edition CD will be included with the December 2012 issue of SYLPH to be released October 22. It will have a bonus track and cast talk only available only on this CD. 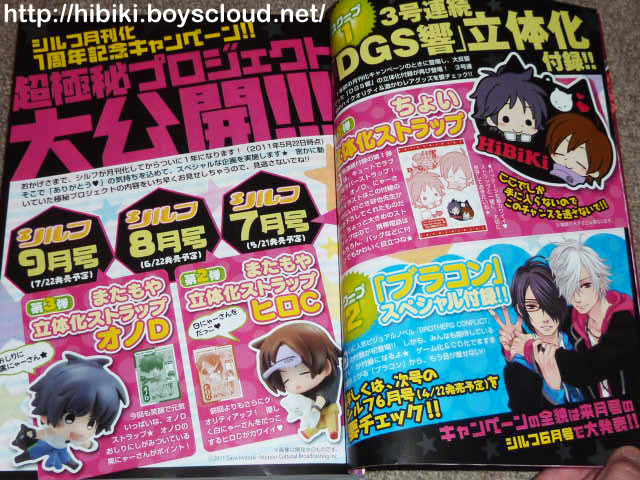 Lastly, the game BROTHERS CONFLICT will become an anime series. An air date has not yet been announced, but the cast will be the same as the game with OnoD as Subaru and Kamiya as the squirrel Juri. There will be no public recording at CharaHobby this year. 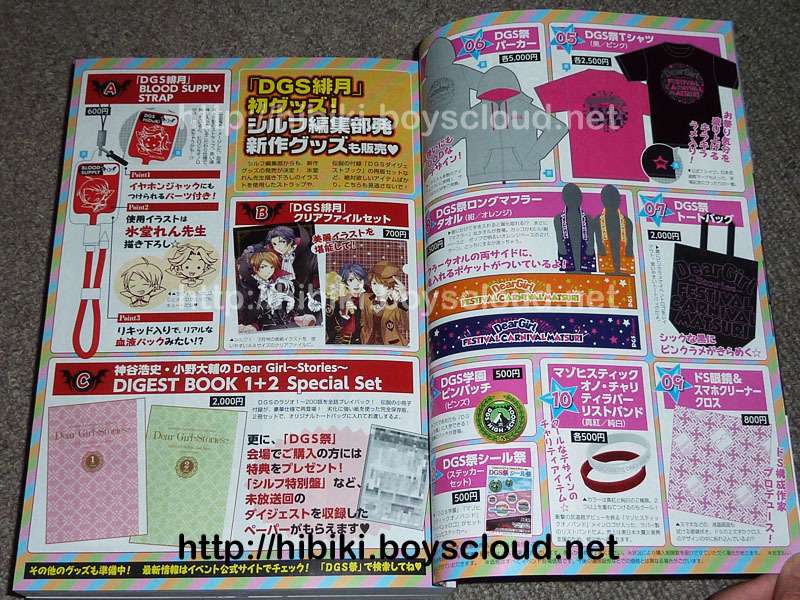 This month’s issue of SYLPH does not include a chapter of DGS Hibiki but they announced the goods that will be on sale at the DGS event in April, as well as upcoming DGS Hibiki furoku that will be included with the magazine. The event is just over a month away. So exciting! Lastly, I mentioned it on Hibiki’s Twitter account, but the release of the DGS album, Stories, has been delayed until April 6th due to the large earthquake on March 11th. A huge announcement was published in this month’s SYLPH (released 1/22). 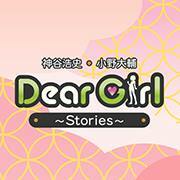 Dear Girl ~Stories~ THE MOVIE on it! The two-disc set will retail for 4700 yen. Pre-orders open tomorrow, January 23. This month’s issue of SYLPH does not include a chapter of DGS Hibiki but came with a DGS Hibiki shitajiki (pencil board). 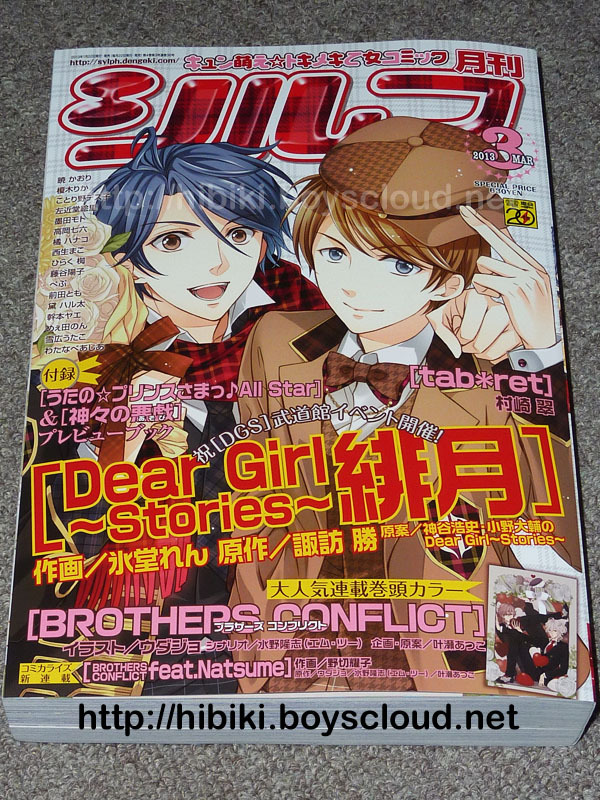 April and May’s issues will both include DGS Hibiki furoku. 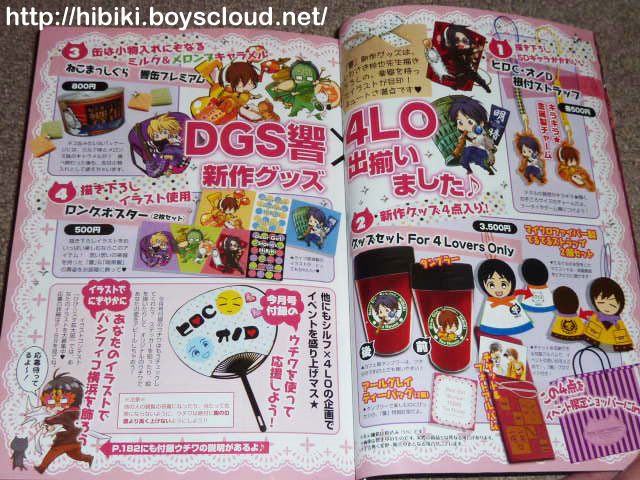 April’s issue will come with body painting stickers of DGS logos and such, and May’s will include an uchiwa (fan).